An excellent family dog, despite its large size, the Cane Corso may be terrifying to intruders but is loving with those it calls its own. 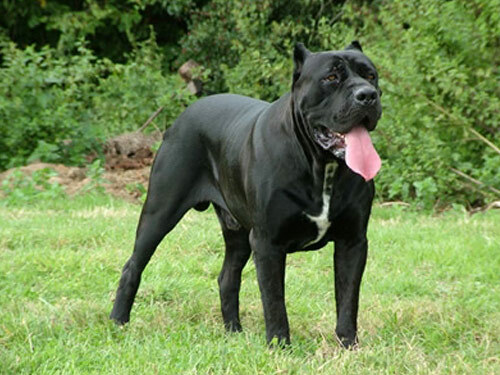 This a dominant breed and will occasionally challenge for authority and it is important that all family members learn how to handle these challenges appropriately; because of this, the Cane Corso may not be a good breed for those with small children. Training should be initiated early, consistently and effectively. Despite their desire to be dominant, the Cane Corso is almost desperate in its desire to love those it calls family. They are gentle and tolerant with children, and will develop separation anxiety if left alone for long periods. If this breed is expected to behave around other animals early socialization is critical. A fenced in yard, consistent and effective training, and early socialization are necessary to keep this breed from dominating and running your family. It is important that all family members attend training sessions as the dog will "pick" on those who cannot establish their place as the dominant pack member. There is little grooming necessary for this breed; though most may have their ears and tails cropped. This breed requires moderate exercise and is an excellent companion for those who like to jog as it makes an excellent guard dog. Hip dysplasia is a common concern for Cane Corso, as well as heart murmurs, cherry eye, ectropion, and entropion. Skin allergies and mange are also commonly found amongst this breed. Potential owners will also want to have their puppy examined for thyroid problems and keep an eye out for potential epilepsy. It is not recommended that the Cane Corso be taken out as a jogging companion until 18 months old, as this allows any potential hip dysplasia to be diagnosed and treatment started. Additionally, some breeders do not take the care necessary to breed out ill-tempered dogs and potential owners should be very careful to spend time with the breeders examining lineage and observing puppies before making a purchase. The Cane Corso has an ancient lineage, dating back to Roman times where they were used in war and to fight lions in the arenas. It served as a protector of homesteads and flocks, a trait that the breed carries today when guarding their home and family. A big game hunter, it is not uncommon to see the breed depicted in artwork fighting wild boar and bear. Though the breed was almost annihilated after WWII, Italian dog lovers took it upon themselves to bring this national treasure back through a controlled breeding program. This breed is gaining in popularity and thanks to its easily trained personality it is used in police work, therapy, search and rescue and a variety of other programs.